as well as the culture of freely saving and sharing seed. Breeders Right: IP for a plant variety. Exclusive right to sell, produce and use the variety, but other breeders are allowed to use the variety in their breeding program. Patent Right: IP for a genetic plant trait (DNA). (all varieties with that trait). No one is allowed to continue breeding plants containing this trait. No one is allowed to grow plants, harvesting seeds/ fruits containing this trait that have not been bought from the patent-holder. THREAT TO BREEDERS. Note the case of the Bolster (organic seed company) which had bred a broccoli variety with a long stem (easier to harvest). This was then patented by Monsanto and the Bolster couldn’t grow their own variety anymore. THREAT TO PEASANT AGRICULTURE. 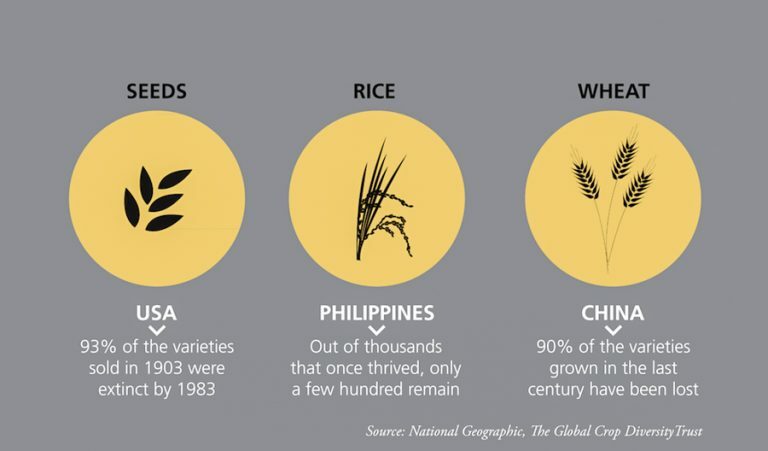 Genetic engineered products can become a threat to peasant agriculture. Here’s the example of Cargill’s ‘EverSweet’ that could be a major threat to small scale farmers in the global south. Read here. GENETIC EROSION. The loss of local species and varieties leads to the irreversible loss of the genetic diversity they contain, including the genes for adaptation to the conditions in which they evolved. This genetic erosion has dangerously shrunk the genetic pool available for the natural selection, and selection by farmers and plant breeders, with a consequent increase in the vulnerability of agricultural crops to sudden climatic changes, as well as the appearance of new pests and diseases. In short, when seeds are in the hands of the peasants, their varieties will adapt to the local conditions. However, when seeds are in the hands of just a few companies, breeding for traits favored by the free market (uniformity, easy to harvest, high yield above nutritional value and local adaptation), the plant varieties will become uniform. We can see what happens when there is a change in the climate, or an occurring pest: with seeds in the hands of the peasants, there is a lot of biodiversity and some varieties will survive. 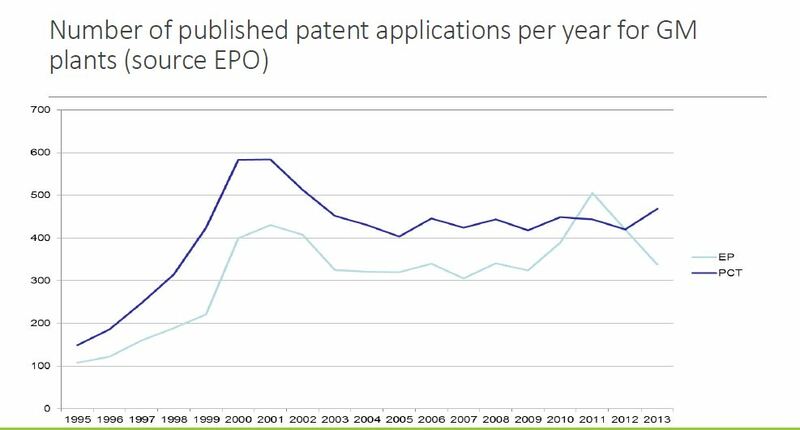 With seeds in the hands of a few multinationals, there is just a little biodiversity and those few varieties might all be non resilient against the pest or climate change..
EPO: European Patent Office (website) ; PCT: Patent Cooperation Treaty. 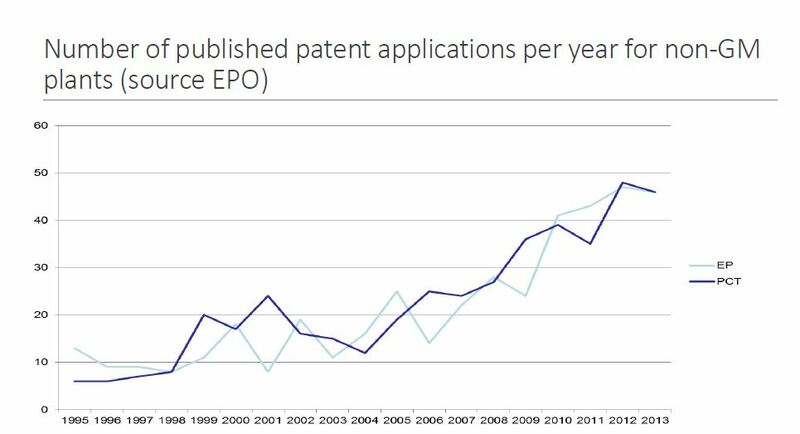 (C) presentation of Dr. Sven J.R. Bostyn, chair expert group on the development and implications of patent law in the field of biotechnology and genetic engineering. 18 May 2016, conference ‘Finding the Balance’. See also the Final Report (2016) for the EU by this group. Report of visit & discussion with Monsanto Wageningen, June 2016. Download here.. Seed Freedom and EU regulations by Vandana Shiva, Ivan Mammana (ASEED) en Elly Janssen (ASEED). VoedselAnders, 2014. Read here.. Peasant Seeds. Rights and Power. Nyeleni, 2011. Download here.. The power over decion making and research/education. Download here..
Down on the Seed: the Worldbank enables corporate take-over of seeds. Oakland Institute, 2017. Download pdf here. Access and Benefit Sharing of genetic resources. – Vanaja Ramprasad (GREEN Foundation, India) talks about the lessons learnt from community seed banks, especially in relation to access and benefit sharing for family farmers. Her video message here..
– Farming Matters, 2016. Access and benefit sharing of genetic resources – Making it work for family farmers. Read the booklet here.. 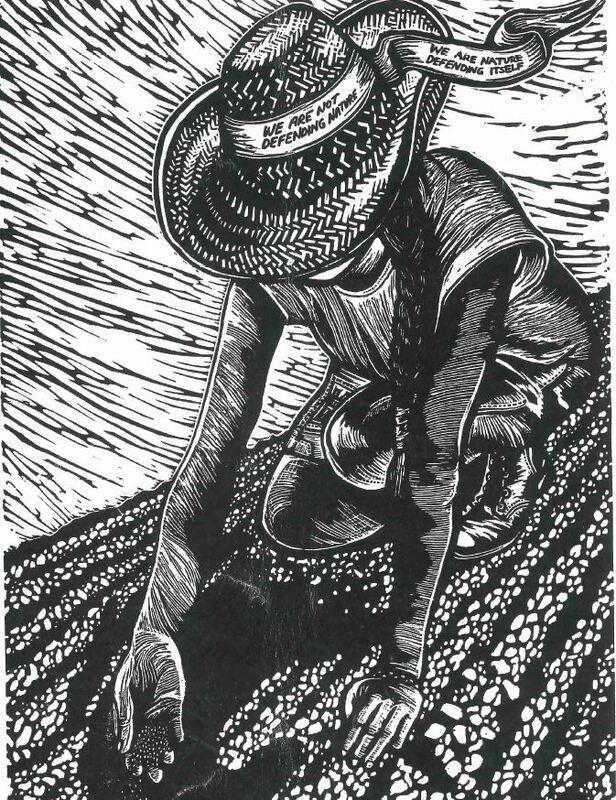 Putting the Cartel before the Horse…and farm, Seeds, Soil, Peasants, etc. – Who will Control Agricultural Inputs, 2013? ETC Group, 2013. Download pdf here.. Concentration of Market Power in the EU Seed Market. The Greens. EFA. Download pdf here.. The Law of the SEED. Download pdf here.. Seeds of Transition. Zeeuwse Vlegel: a Promising Niche for Sustainable Wheat Production. Wiskerke and Oerlemans. Download here.. The story of seed has become one of loss, control, dependence and debt. It’s been written by those who want to make vast profit from our food system, no matter what the true cost. It’s time to change the story. Seeds of Freedom charts the story of seed from its roots at the heart of traditional, diversity rich farming systems across the world, to being transformed into a powerful commodity, used to monopolise the global food system.The film highlights the extent to which the industrial agricultural system, and genetically modified (GM) seeds in particular, has impacted on the enormous agro -biodiversity evolved by farmers and communities around the world, since the beginning of agriculture. Seed Matters is a short film which explores the importance of seed – for the environment, health, food and sustainability, the issues facing it and ways to overcome these problems. The film gathers some of the key people who attended the Great Seed Festival in 2014, including Mama Udongo of Community Centred Knowledge, Liz Hosken of the Gaia Foundation and Patrick Mulvany of the UK Food Group. They each share their thoughts on food, diversity, genetic modification and other matters around seed. A documentary on traditional diets and how they are grown and eaten in eleven countries: Spain, France, Italy, India, Sri Lanka, China, Vietnam, Taiwan, Papua New Guinea and Solomon Islands. “Our Seeds” addresses the problems of globalised food based on hybrids that require pesticides and synthetic fertilisers. The UK government, the EU and other rich nations have been channelling billions of pounds towards a model that pushes these chemical techniques on farmers. See the powerful story they have been sold by the world’s biggest food and agricultural corporations. We went to Tanzania to hear about another story. It is a story without the multi billion pound investments. But instead it has people power. Millions of small-scale farmers across the world are building an ecological model of farming that increases yields but doesn’t require chemicals, making it better for the environment and importantly gives control over food growing to the farmer rather than a corporation. Seed Act is a short film about how different people and organisations get hands on for seed sovereignty, to protect life, biodiversity and the production of healthy seeds, in a world which is increasingly regulated and suffocated by seed acts, legislations limiting what has always been humanity’s birthright: to sow, cultivate, harvest, consume and exchange natural seeds. From Seed to Seed is a pedagogical film intended for all those who wish to learn how to produce their own vegetable seeds. With the help of magnificent images and short animated drawings it shows, step by step, the production of seeds of 32 kinds of vegetables. In addition, eight theoretical or practical ‘ABCs’ explain the general bases of seed production. You will understand the cycle of each vegetable from seed to seed, the biology of their flowers and the phenomenon of pollination. You will be able to follow in detail the gestures and techniques used for harvesting, extracting, sorting and storing seeds. 4 DVDs in English, French and German versions, 436 minutes. On the website http://www.seedfilme.org/ you can find more information about the content and how to get a copy. In the Netherlands you can order the film at Omslag. The film is made by people from Longo maï, a European network of agricultural cooperatives. Where can I find seeds and seedlings?